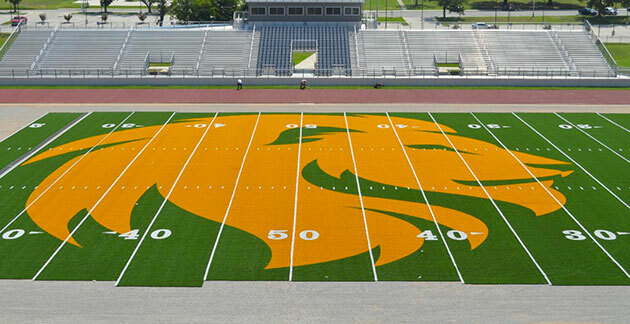 Texas A&M-Commerce is in the midst of a total field redesign, and as you can see, the dominant element on their new field is a logo so gargantuan it runs sideline to sideline. 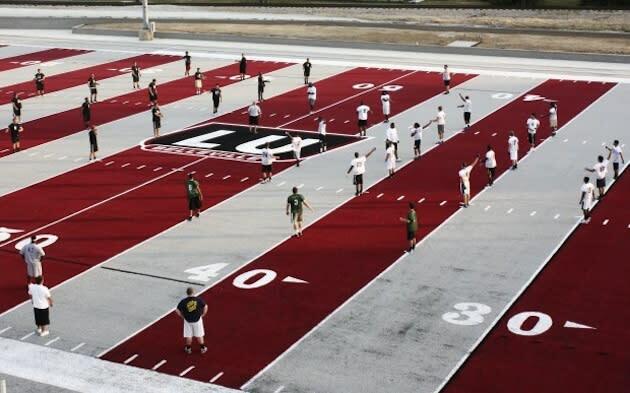 That's impressive indeed, and it's part of an ongoing trend toward exotic fields of play in an effort to spark fan enthusiasm. (See, for instance, the garish new basketball courts of Florida International and Central Florida.) It's coming to your favorite field, friends, like it or not. 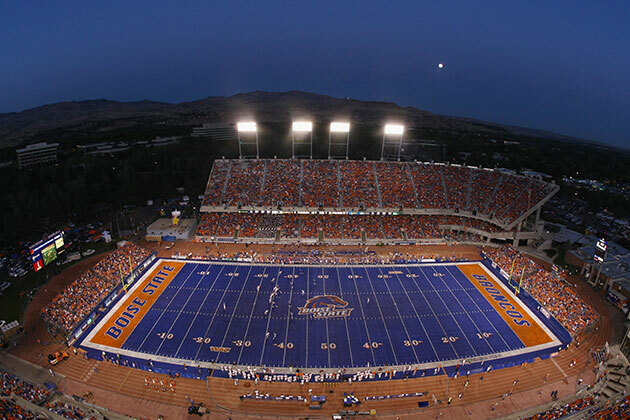 Boise State. The classic. 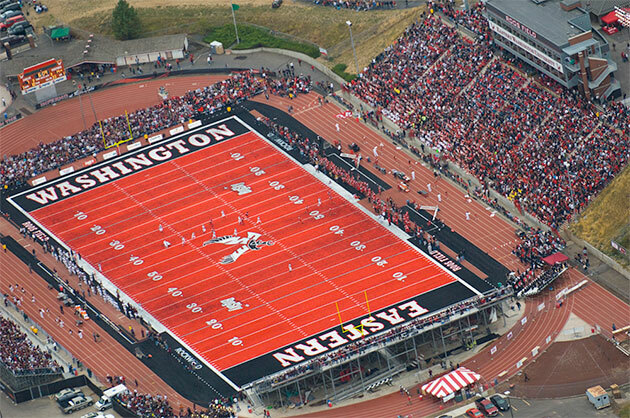 Boise State gets a pass for its Smurf Turf because the team was the first major program to experiment with a wild-colored field, and because the Broncos have had success on a national level. Winning solves everything. Eastern Washington. Well, at least it can't get stained by blood. Also, like Boise State, it can probably be seen from orbit. Lindenwood University-Belleville (Ill.): The "flattened-out barbershop pole," as we called it, remains one of the most distinctive fields in the nation. And a punch in the gut remains one of the most distinctive forms of greeting. 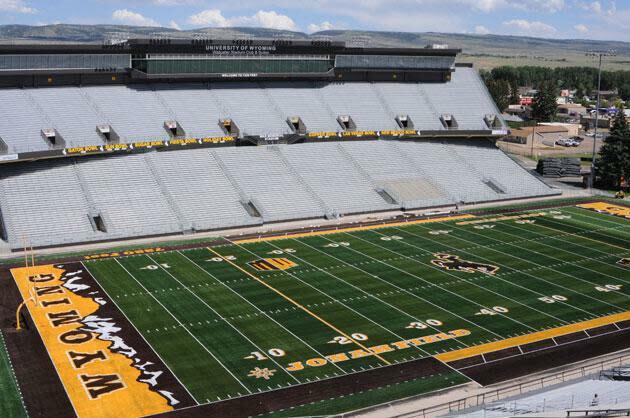 University of Wyoming. All right, at least the field's green. The mountains in the end zone are a nice touch; if some Cowboy doesn't incorporate them into an end-zone celebration, we'll be disappointed. 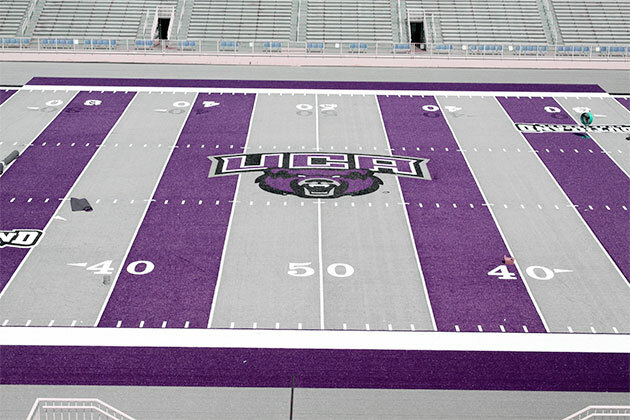 Central Arkansas: When your field's the color of a bruise, it's threatening. Or strange? Absurd? We'll go with threatening. So there you go. This, folks, is the price of progress. Got a stadium we missed? Hit us up right here.